Many books and articles have been written on the broad subject of nymph fishing. The topic is one that cannot be addressed in just a single article. I’m going to attempt to address as much as possible over the course of at least 2-3 articles. 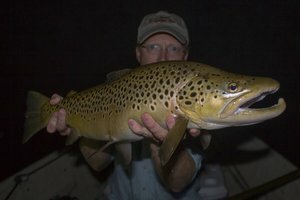 In this first article I will try and present some of the theory that I believe affects the degree of success for any nymph fisherman. Then, with my theories explained, I will attempt to share my thoughts on specific situations and how to approach them to increase your success. One way to become a better nymph fisherman is simply trial and error while out on the water. Having someone to show you a trick or two definitely speeds up the process however. 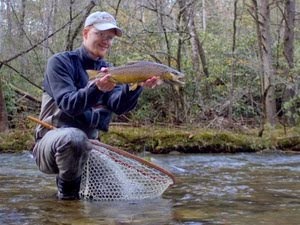 My first true lesson on nymph fishing came from long-time Smoky Mountain guide Walter Babb. Previous to this experience, my only understanding of the topic came from reading articles and any other material I could get my hands on. 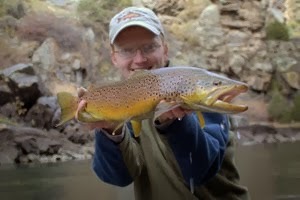 In general, I can learn most things through reading about them, but fly fishing has been an experience where watching a master can save months or even years of experiments. The small detail that I had not really understood sufficiently before my lesson was line management. Keeping as much line off the water as possible is extremely crucial, and I cannot emphasize it enough. In my opinion, you always want the line to enter the water anywhere from directly above to slightly downstream (or downcurrent which is not always downstream) of your flies. Generally, the current itself will eventually get your drift aligned properly eventually, especially if you are using an indicator, but what happens when a fish hits very early in the drift if your line has slack in it? My reasoning is that if the line is entering the water upcurrent of your flies and a fish takes, there is slack in the line which will delay any indication of a strike. That split second is crucial to actually hooking and landing the fish. 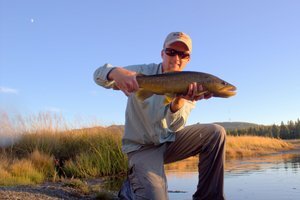 If you have reached that point in your fly fishing career where you don’t worry about the number of fish hooked and are just satisfied by tricking the fish into sampling your flies, then stop reading now. If you want to catch more fish, read on. Here is an attempt at an in-depth explanation using some basic high school geometry. If you don’t need convincing of my logic or really hate math, you can skip the next few paragraphs and just trust me on this one. For the rest of you, recall that in right triangle trig, the sine of an angle A is the length of the side opposite of A over (or divided by) the length of the hypotenuse. Cosine of an angle A is the length of the side adjacent to A over the length of the hypotenuse. In the diagram below, notice the direction of the current. The fly is downcurrent of the indicator. For the sake of our illustration, let’s just use an indicator depth of 4 feet. Assume that the fly is at an angle that is 3o degrees from vertical. In other words, the flies are NOT directly under the indicator. Solve the triangle drawn onto the diagram using the sine and cosine formulas. For the sake of our illustration, assume that when a fish takes the fly, it does not rise or drop vertically in the water column after eating. As the indicator drifts downstream over the fish, the fly is now stationary in the fishes mouth. 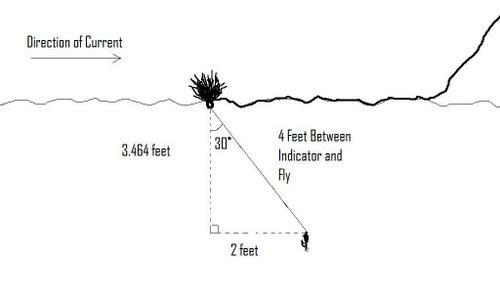 The indicator is still drifting though and as it comes vertical over the fish, we have over half a foot of line unaccounted for or causing slack between the fish and the indicator (see diagram below). In fact, until the fly is 30 degrees upcurrent of the indicator, we will continue to have slack in the line. The indicator can drift up to 4 feet downstream in our particular illustration before the slack is removed between indicator and fish. Clearly, if you cast so that your flies are entering the water upcurrent of the indicator or rest of your line, you will be in a much better position to detect any takes, especially the soft ones where the fish barely moves at all. A particularly memorable example of the importance of this principle occurred last summer on the Caney Fork River. I was floating with David Perry of Southeastern Fly along with my cousin Nathan. We were having a nice day but had not found any nicer browns yet. As we drifted into the back of a large pool, David P. suggested that I cast to a particular spot. It was straight across the river from the boat, but I hooked the cast so my flies dropped in upstream of the indicator. Almost immediately the indicator pulled gently under. 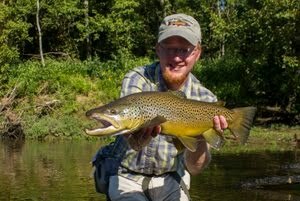 Instead of the routine stocker rainbow, a nice 18 inch brown was soon thrashing in the net. Getting those flies in the correct position fooled a beautiful fish that really made my day. Now that you know the basis of my theory, I will move into explaining other important principles to increase your success as a nymph fisherman. I nymph more than anything else it seems, and have found that most of the time it is the best way to bring good numbers of fish to hand. 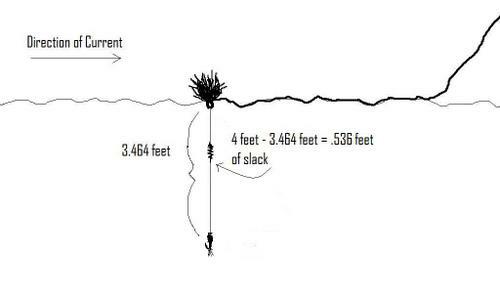 There are many exceptions to this generalization, but the fact remains that improving your skills as a nymph fisherman will drastically improve your catch rates. Great post, David. As an unsuccessful amateur, this is good stuff! Great stuff here. I've been reading through your archives, and you've got some great stuff here. Keep up the good work.